EFMD has signed a strategic partnership with CVTRUST. The aim of CVTRUST is to increase trust where it is becoming ever more valuable: in academic and education credentials. 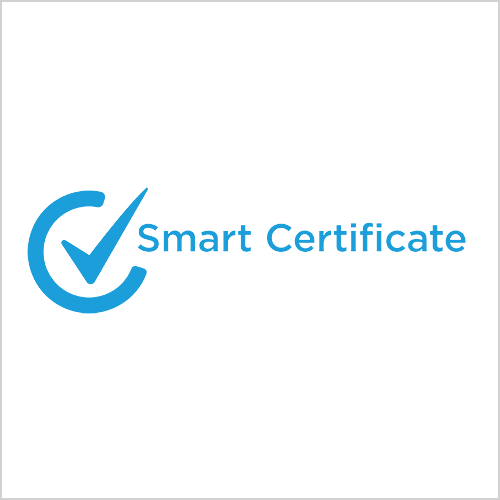 Smart Certificate™ (USPTO granted patent) is a highly secure, easy to use solution to grant thousands of education credentials in just a few clicks: diplomas, certificates, attestation letters, transcripts, badges, etc. The purpose is to make life easier for academic institutions and education bodies as well as their graduates and alumni by creating a digital academic passport to store and showcase credentials. Graduates from universities, business schools and training centers can now collect certified credentials in this centralized space, for life. Indeed, in a world where continuous education is becoming the norm, Smart Certificate™ is the digital passport allowing people to control and show off all their credentials for any job opportunity. In the education world, the verification of credentials is a major challenge that can't be solved alone. That's why Smart Certificate™ works as a connection within the learners-trainers-recruiters ecosystem, offering a secure, reliable and user-friendly solution. Practical, time-saving and money-saving for all parties, it moreover has an essential added value for academic institutions as it is a new and effective way of staying in touch with their alumni. web connected credentials as a lifetime bond between academic institutions and their alumni, allowing alumni associations to keep in touch with their members, get up-to-date information and find lost alumni. CVTRUST joined LinkedIn’s Direct-to-Profile program, adding a new social dimension to its Smart Certificate™ solution. It is now possible for Smart Certificate™ owners to upload their certified credentials onto their LinkedIn Profile in just a click! By granting Smart Certificate™ to your graduates, alumni, programme participants etc they are able to validate and push their credentials onto their LinkedIn profile in one click. Following on from this schools that use the Smart Certificate™ solution can now make use of a new service Smart Ads™. The new Smart Ads™ feature is unique because it allows your school to use the CVs of the people connected to the school as marketing and branding tools that can help promote your institution (and programmes) by your best ambassadors. If you use Smart Certificate™ then every award that you have ever granted becomes firstly validated and secondly becomes a marketing tool to showcase your school. The examples below show how it can work (click and see the Smart Ad on the upper right side the institution’s banner). As Smart Certificate™ was conceived with academic institutions in mind, two versions have been developed. The first version can be used without any need to integrate into existing IT software systems. The second version can be fully integrated with the ERP used by the institution. For that, CVTRUST has created partnerships with all major ERPs used in the academic world in order to be compatible with any of their software and to be easily used along existing web services. EFMD Member Offer: Smart Ads™ free for 1 year! For many business schools and universities the recruitment season is drawing to a close and offers are being sent to your 2017/18 class. As recruitment teams start to think about where to find the next class, why not solicit the help of your alumni and graduates? When posted to a LinkedIn profile, or shared via other channels, Smart Certificates™ become personal electronic recommendations that turn alumni into your best marketing tool. And embedded in the certificates are Smart Ads™ that bring potential candidates direct to you. However, not all education organizations want to leverage alumni communities for program marketing; some just want a turnkey solution to generate and manage secure digital credentials. In recognition of the diverse needs of our client base, CVTrust is pleased to announce a new range of product and service packages. Whether you are a small or large education and training organization, we have a solution that meets your needs. We’re also offering EFMD members a very special offer: sign up for Smart Certificates™ and get Smart Ads™ free for 1 year from the contract date. There is no better time to implement the Smart Certificate™ solution. Get in touch with David Goldenberg to find out more. If you have any other questions regarding how EMFD is supporting this initiative, please contact Matthew Wood, Director of Operations, EFMD.